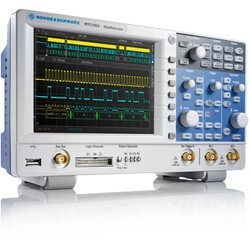 RTC1000 Rohde & Schwarz Oscilloscopes ! !Special Offers!! 2 channel oscilloscope with 50 MHz Bandwidth, 2 GSa/s sample rate, 8 Bit A/D converter, 2 Mpts memory depth and a 16.5 cm (6.5") display (640x480 pixel). Upgradable to a MSO with a 8 channel logic analyzer. Incl. 1 channel waveform generator and pattern generator. RTC1000 Oscilloscope2x R&S® RT-ZP03 probes, RTC-B6 ARB generator, software and power cord. 2 channel oscilloscope with 50 MHz Bandwidth, 2 GSa/s sample rate, 8 Bit A/D converter, 2 Mpts memory depth and a 16.5 cm (6.5") display (640x480 pixel). Incl. MSO option with 8 channel logic analyzer and a 1 channel waveform generator and pattern generator. RTC1000 Oscilloscope,, 2x R&S® RT-ZP03 probes, RTC-B1 MSO Option, RTC-B6 ARB Generator, software and power cord. 2 channel oscilloscope with 70 MHz Bandwidth, 2 GSa/s sample rate, 8 Bit A/D converter, 2 Mpts memory depth and a 16.5 cm (6.5") display (640x480 pixel). Upgradable to a MSO with a 8 channel logic analyzer. Incl. 1 channel waveform generator and pattern generator. RTC1000 Oscilloscope, 2x R&S® RT-ZP03 probes, RTC-B220 bandwidth upgrade, RTC-B6 ARB Generator, software and power cord. 2 channel oscilloscope with 70 MHz Bandwidth, 2 GSa/s sample rate, 8 Bit A/D converter, 2 Mpts memory depth and a 16.5 cm (6.5") display (640x480 pixel). Incl. MSO option with 8 channel logic analyzer and a 1 channel waveform generator and pattern generator. RTC1000 Oscilloskope, 2x R&S® RT-ZP03 probes, RTC-B220 bandwidth upgrade, RTC-B1 MSO Option, RTC-B6 ARB Generator, software and power cord. 2 channel oscilloscope with 100 MHz Bandwidth, 2 GSa/s sample rate, 8 Bit A/D converter, 2 Mpts memory depth and a 16.5 cm (6.5") display (640x480 pixel). Upgradable to a MSO with a 8 channel logic analyzer. Incl. 1 channel waveform generator and pattern generator. RTC1000 Oscilloscope, 2x R&S® RT-ZP03 probes, RTC-B221 bandwidt upgrade, RTB-B6 ARB Generator, software and power cord. 2 channel oscilloscope with 100 MHz Bandwidth, 2 GSa/s sample rate, 8 Bit A/D converter, 2 Mpts memory depth and a 16.5 cm (6.5") display (640x480 pixel). Incl. MSO option with 8 channel logic analyzer und a 1 channel waveform generator and pattern generator. RTC1000 Oscilloscope, 2x R&S® RT-ZP03 probes, RTC-B221 bandwidt upgrade, RTC-B1 MSO Option, RTB-B6 ARB Generator, software and power cord. 2 channel oscilloscope with 200 MHz Bandwidth, 2 GSa/s sample rate, 8 Bit A/D converter, 2 Mpts memory depth and a 16.5 cm (6.5") display (640x480 pixel). Upgradable to a MSO with a 8 channel logic analyzer. Incl. 1 channel waveform generator and pattern generator. RTC1000 Oscilloscope, 2x R&S® RT-ZP03 probes, RTC-B222 bandwidt upgrade, RTB-B6 ARB Generator, software and power cord. 2 channel oscilloscope with 200 MHz Bandwidth, 2 GSa/s sample rate, 8 Bit A/D converter, 2 Mpts memory depth and a 16.5 cm (6.5") display (640x480 pixel). Incl. MSO option with 8 channel logic analyzer and a 1 channel waveform generator and pattern generator. RTC1000 Oscilloscope, 2x R&S® RT-ZP03 probes, RTC-B222 bandwidt upgrade, RTC-B1 MSO Option, RTB-B6 ARB Generator, software and power cord. 2 channel oscilloscope with 300 MHz Bandwidth, 2 GSa/s sample rate, 8 Bit A/D converter, 2 Mpts memory depth and a 16.5 cm (6.5") display (640x480 pixel). Upgradable to a MSO with a 8 channel logic analyzer. Incl. 1 channel waveform generator and pattern generator. RTC1000 Oscilloscope, 2x R&S® RT-ZP03 probes, RTC-B223 bandwidth upgrade, RTC-B6 ARB Generator, software and power cord. 2 channel oscilloscope with 300 MHz Bandwidth, 2 GSa/s sample rate, 8 Bit A/D converter, 2 Mpts memory depth and a 16.5 cm (6.5") display (640x480 pixel). Incl. MSO option with 8 channel logic analyzer and a 1 channel waveform generator and pattern generator. RTC1000 Oscilloscope, 2x R&S® RT-ZP03 probes, RTC-B223 bandwidth upgrade, RTC-B1 MSO Option, RTC-B6 ARB generator, software and power cord.